It is said that the DPRK is very serious about preserving and purifying the Korean language. And I have always been under the impression that Korean language used in the DPRK has minimal English loan words and quite a few Russian ones rather. 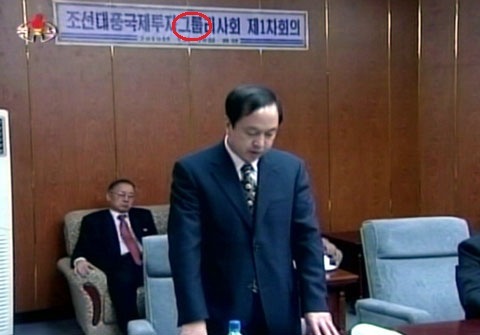 I was amazed when I saw this photo, taken from the KCTV showing Park Chol-su, a Chinese josunjok appointed by the DPRK government to head the Taepung International Investment Group, speaking under a banner that reads “조선태풍국제투자그룹리사회 제1차회의” (Korean Taepung International Investment Group First Board Meeting). I was quite surprised to see that they use “그룹” (geurub, “group”) in the DPRK! What would the Great Leader say about this? Would the Great Leader have approved? Do you have the hanja for Park Chol-su? I ran across this same image somewhere on the Chinese internet (perhaps a Yanbian city news page?) and can’t track it down all of a sudden. But failing that, I will observe that the WPK cadre in the background of the image is distinctly asleep and that Daily NK ran an excellent story in 2007 about how NK was fighting to prevent South Korea-inflected Anglicisms into their language like “han-tu-pon” for cell phone. In such cases, the Chinese equivalents were leaned upon instead! Sorry for being a little late in getting back to you. Park Chol-su in Hanja is 朴哲洙. And it is my understanding that even though the DPRK has completely eliminated hanja from the Korean language they do teach kids some hanja starting at the middle school level (not yet verified).